To be frank, I’m not much of a doughnut-fryer anyway. I made them with my dad a few times when I was young, a few times as an adult, including a delicious gluten-free recipe, but I can’t eat them fast enough to prevent that rancid second-day flavor, and I just plain hate buying that much oil. I mean really, when did vegetable oil get so expensive? So I bake them. Yes, it’s one more thing you need to buy at your favorite kitchen supply store, but doughnut pans are worth it. 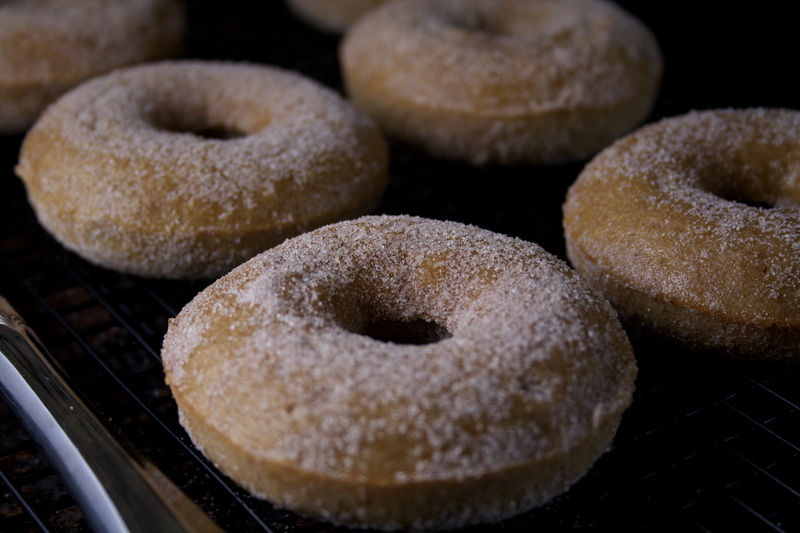 The doughnuts stay fresh for so much longer, and with the right recipes, they taste pretty damn close to the real thing. 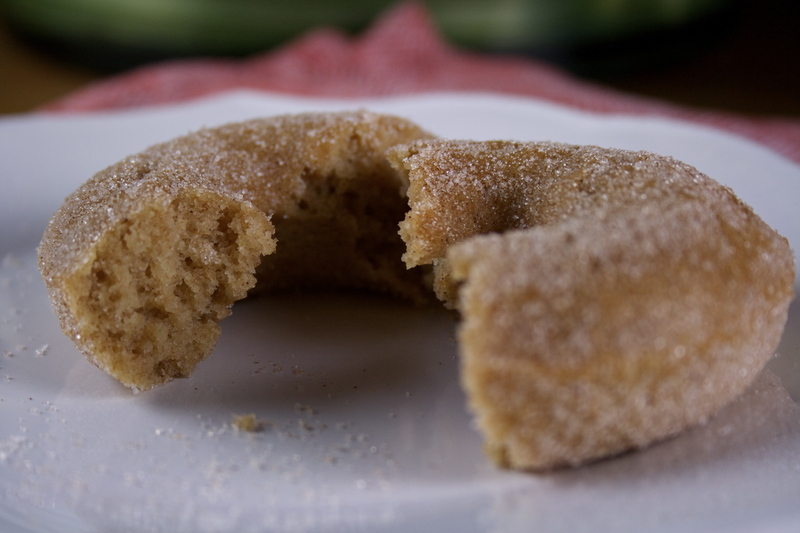 These apple cider doughnuts, though, aren’t just close, they are the real thing. This truly is an easy, down-home recipe, from the prep to the finish. All ingredients are whisked together before adding the flour, which is, believe it or not, the final step before baking. It’s a one-two punch. Unlike some other recipes I’ve found, these guys actually are made with apple cider. It’s boiled down to nearly a syrup, concentrating the apple flavor and maxing the tart tang you get from a crisp, fresh apple just off the tree. 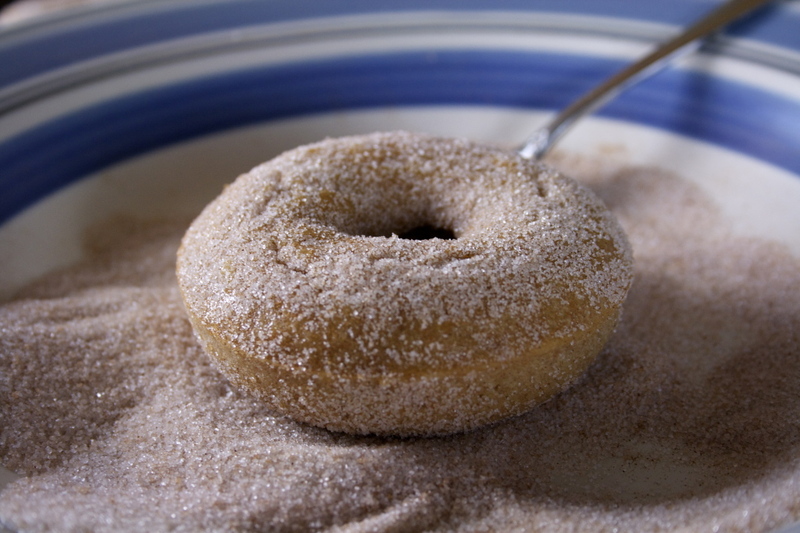 Another, sweeter layer is added in the form of applesauce, infusing the doughnuts with more moisture. Whole wheat flour lends these beauties a bit of a rustic touch, like they just came off the farm, and the butter enriches them in a way that oil simply can’t. 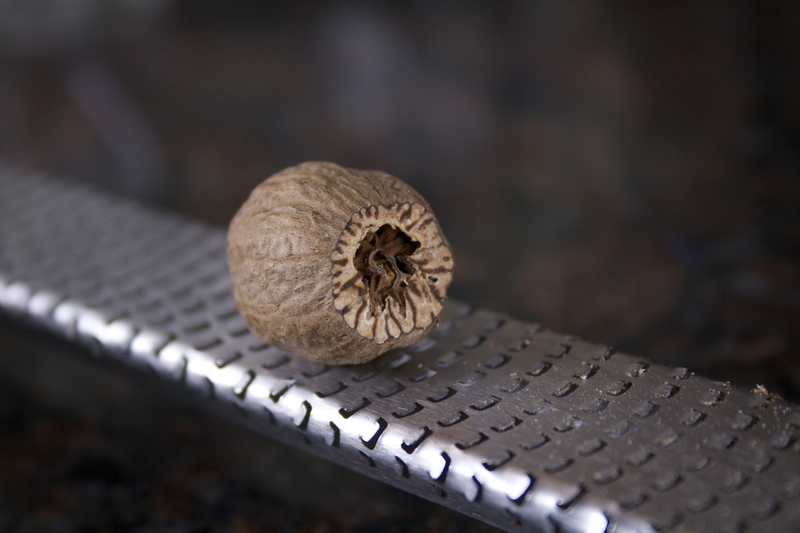 A good helping of cinnamon and a touch of nutmeg, and they taste exactly like the ones I’d get fresh after apple picking at my favorite orchards in New Jersey. I like to toss mine in cinnamon sugar. 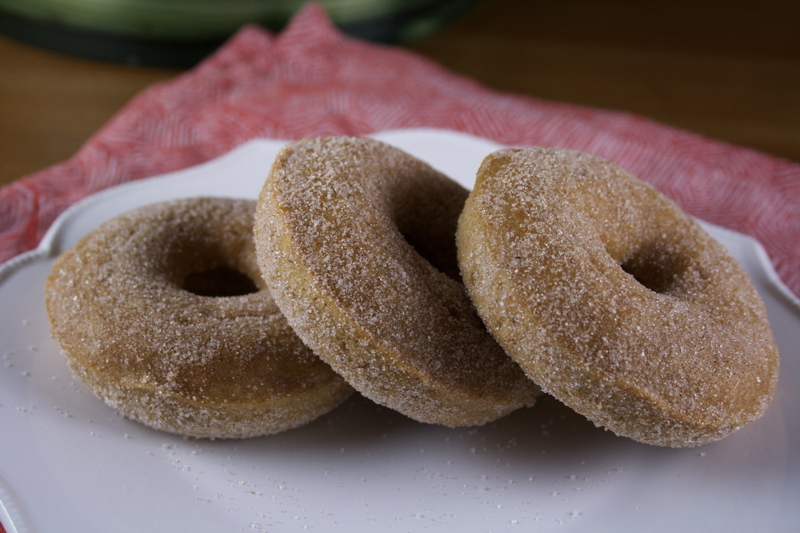 Fancy glazes are lovely, but the apple cider doughnuts I know are simple. They feel like home. 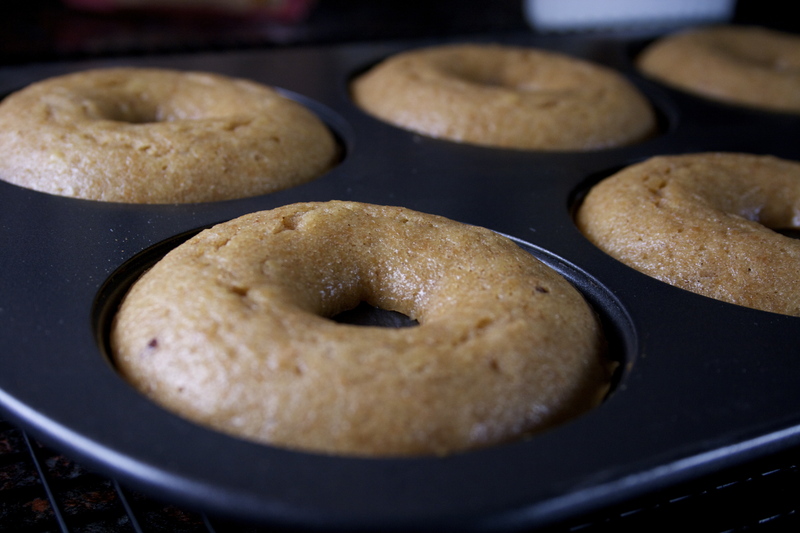 Until I began experimenting with this recipe, most of my baked doughnuts ended up tasting (and looking) like muffins. It wasn’t just the ingredients or the texture of the finished product, it was the method of getting the batter into the doughnut wells. I always filled them too high, or too unevenly. Spooning batter into narrow little moats is no joke. The solution? Pastry bags – or, in my case for this batch, plastic bags with a corner cut off. Huge thanks to The FauxMartha for hipping me to this trick. I squeeze the batter around each well in circles. If I need to add more, I stay nearer to the outside, helping to keep the doughnut holes in tact. Want to make them gluten-free? Use your favorite gluten-free flour blend (I like Cup 4 Cup), and up the baking powder to 2 1/4 teaspoons. Preheat oven to 350 degrees and lightly grease two standard doughnut pans. Pour 1/4 cup of the cider into a small saucepan and take note of its height. 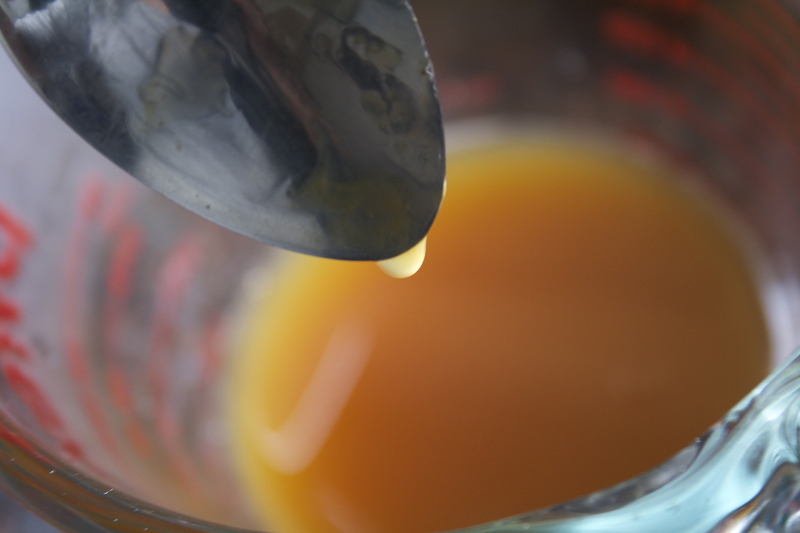 Pour the remaining 3/4 cup and bring to a simmer over medium heat, stirring occasionally. Simmer until the cider is reduced to ¼ cup, about 20 minutes. It should have thickened and should coat the back of a spoon. 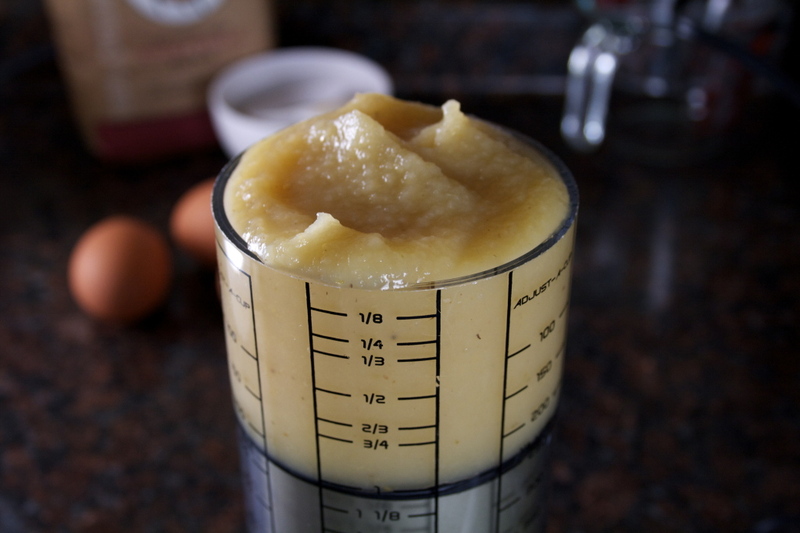 Measure it out and set it aside to cool slightly while you measure and dump the rest of your ingredients. 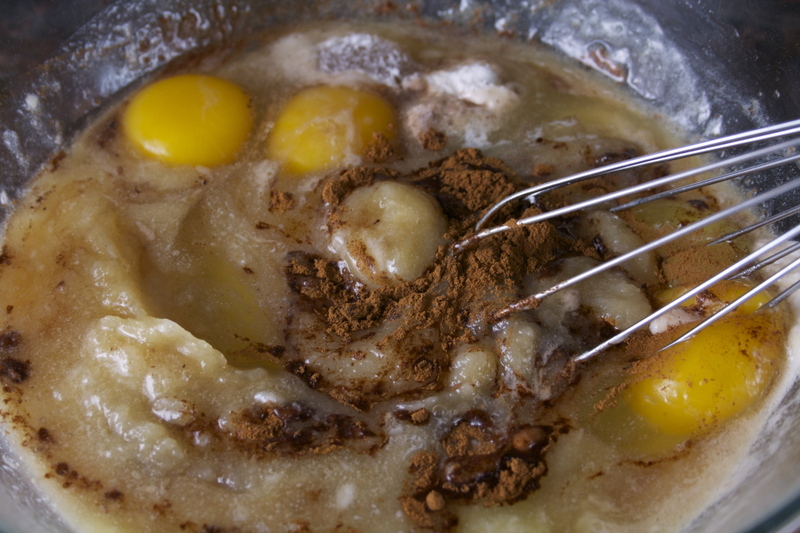 Whisk together the melted butter, eggs, sugar, applesauce, vanilla, cinnamon, nutmeg, salt, baking powder, and cider until smooth. Add the whole wheat and all purpose flours, stirring until just smooth. As with other recipes, be careful not to over-mix. Some lumps will be natural from the applesauce. Just make sure there aren’t lumps of flour. 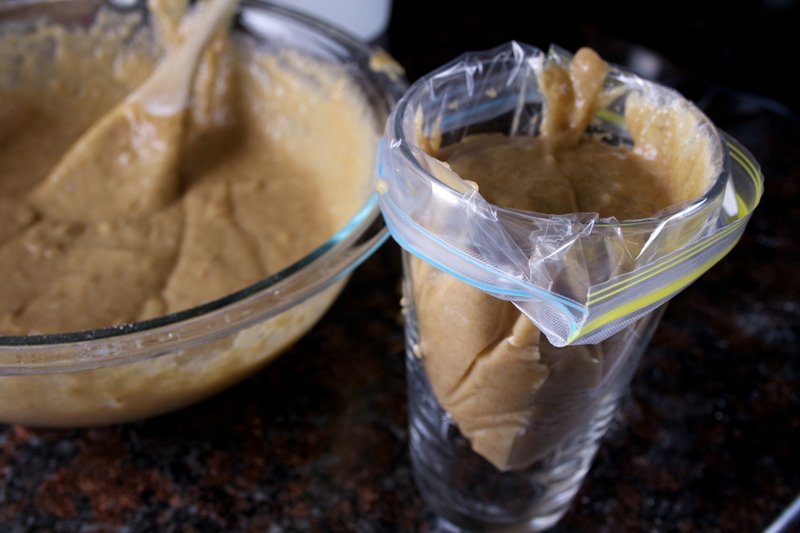 Drape a pastry bag or plastic bag inside a tall drinking glass, to steady it, and fill with batter. If using a plastic bag, seal and cut a corner about a quarter of an inch in. Pipe in your batter evenly into each well, nearly to the rim. 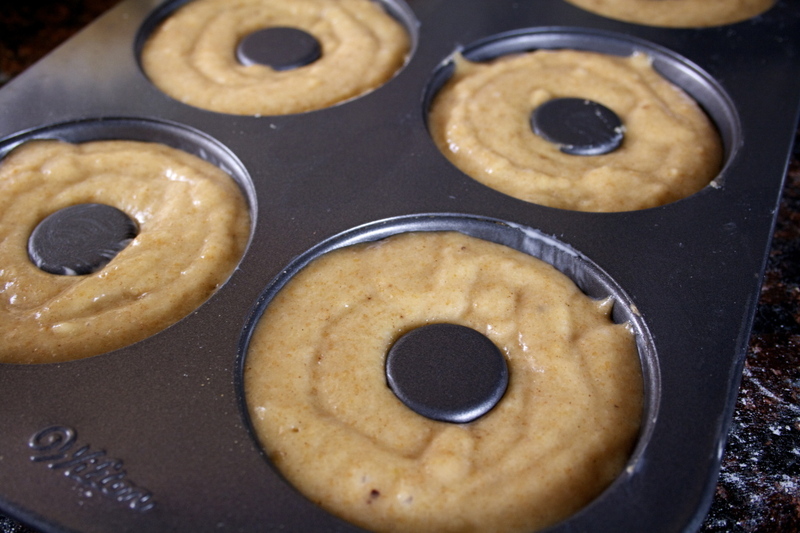 Bake for 15 to 18 minutes, or until a toothpick inserted into the center of one of the doughnuts comes out clean. Run a knife gently around the edges of each doughnut to loosen. Let cool in the pans for about five minutes, then remove to a wire rack. 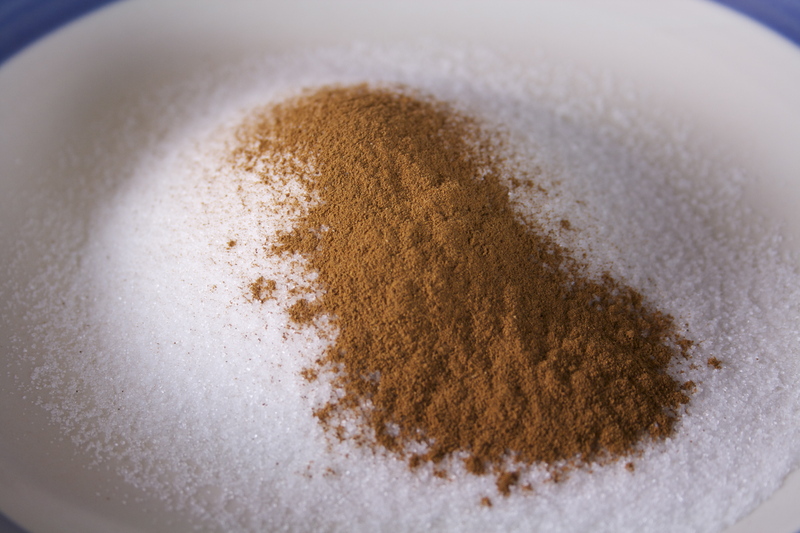 Prepare your cinnamon-sugar mixture in a shallow bowl. 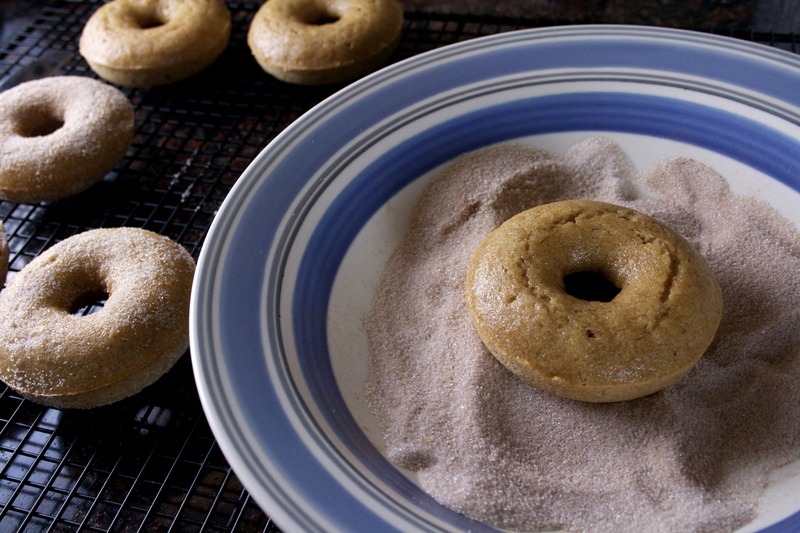 While the doughnuts are still warm, toss in the cinnamon mixture to coat.